Sean Harvey is a PhD candidate in History at Northwestern University. 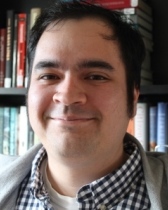 His dissertation is titled “Assembly Lines: Maquiladoras and the Making of the U.S.-Mexico Borderlands,” which is a political and environmental history of maquiladoras. In this project, he argues that maquiladoras, which, are export-oriented assembly factories located along the U.S.-Mexico border, originated in the economic and environmental policies of the New Deal and Great Society. Sean is originally from Phoenix, Arizona, but currently lives in Chicago, IL with his wife, son and three cats. In his spare time, he enjoys spending time with his family and unabashedly listening to pop-punk classics from the 1990s.